Clinton campaign ponders: What if Trump doesn’t concede? WHITE PLAINS, N.Y. — Hillary Clinton’s campaign is increasingly preparing for the possibility that Donald Trump may never concede the presidential election should she win, a development that could enormously complicate the crucial early weeks of her preparations to take office. Aiming to undermine any argument the Republican nominee may make about a “rigged” election, she hopes to roll up a large electoral vote margin in next month’s election. That could repudiate the New York billionaire’s message and project a governing mandate after the bitter, divisive presidential race. 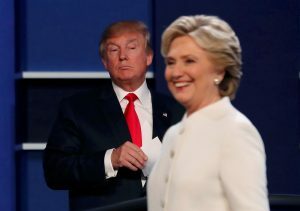 Clinton’s team is also keeping a close eye on statements by national Republican leaders, predicting they could play an important role in how Trump’s accusations of electoral fraud might be perceived. That’s according to several Clinton campaign aides, who spoke on condition of anonymity because they were not authorized to publicly discuss internal strategy. While Clinton’s campaign has long focused on maintaining pathways to cross the threshold of 270 electoral votes, it’s now looking to capture an expanded number of states that could also help determine control of the Senate — including Republican-leaning Arizona. “They’re looking at it like this: We’ve got these doors of opportunity open, let’s make sure we go down all of them,'” said Jeremy Bird, the national field director for President Barack Obama’s 2012 campaign who is helping Clinton’s team. Some Republicans are already preparing for Trump’s defeat, downplaying the significance of a Clinton triumph. “On Nov 8, Clinton’s claims of a mandate will fly in the face of reality. She only won by not being Trump,” tweeted conservative writer Erick Erickson. Rolling up a big victory in the Electoral College would let Clinton push back against that notion and assert that voters had rejected what she has called Trump’s mean, divisive message. In a race against Trump and independents Gary Johnson and Jill Stein, Clinton may struggle to reach 50 percent of the vote. But competing in states such as Arizona and pushing for Senate victories in Missouri and Indiana might help Democrats in their quest to recapture the Senate and give her a better chance of surpassing Obama’s 332 electoral votes in the 2012 campaign. Clinton’s campaign is making a significant push in Arizona, which offers 11 electoral votes and has stayed in the Republican column in all but one presidential election since 1952. Bill Clinton was the last Democrat to carry the state, in 1996. First lady Michelle Obama courted voters in Phoenix on Thursday, following appearances by Vermont Sen. Bernie Sanders and the Clintons’ daughter, Chelsea Clinton. The campaign is spending $2 million in advertising and toying with sending Clinton herself there before Election Day. “I think it’s clear that Hillary Clinton has a chance to win Arizona just like her husband did 20 years ago,” said Rodd McLeod, a Phoenix-based Democratic strategist who helped Clinton’s campaign during the primary. Utah overwhelmingly supported Mitt Romney, the nation’s first Mormon presidential nominee, with more than 72 percent in 2012. But many of the state’s Republicans have abandoned Trump and polls show Clinton and Trump in a tight contest against independent Evan McMullin, a conservative former CIA officer who graduated from Brigham Young University.